South by Southwest (SXSW) is a set of festivals and conferences. They are about movies, interactive media, and music. 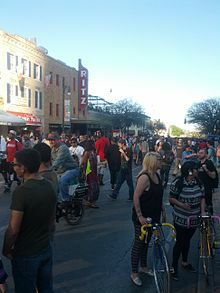 It takes place every year in March in Austin, Texas, United States. It began in 1987. It has continued to grow in both scope and size every year. South by Southwest is run by the company SXSW, Inc.
SXSW Music is the largest music festival in the world.[source?] It had more than 2,000 performances in 2014. In 1987, 700 people attended the music event. In 2009, there were over 32,000 registrants. Bands must pay for their own travel and lodging at the event. All performers get a cash payment ($100 for solo musicians or $250 for bands) or a wristband that gives them access to all music events. SXSW Film Conference lasts for five days. There are speakers, workshops, mentor sessions and more, with expert filmmakers and industry leaders. In 2015, there were over 250 sessions with 735 speakers. Important speakers in the past include Lena Dunham, Jon Favreau, Mark Duplass, Ava DuVernay, Ryan Gosling, Nicolas Cage, Alejandro Jodorowsky, Tilda Swinton, Amy Schumer, Sally Field, Joss Whedon, Christine Vachon, RZA, Matthew McConaughey, Danny Boyle, Seth MacFarlane, Catherine Hardwicke, Richard Linklater, David Gordon Green, Harmony Korine, Henry Rollins, Sarah Green and Robert Rodriguez. The SXSW Film Festival runs nine days. The SXSW Film Awards is on the last day of the Film Conference. In 2015, the SXSW Film Festival showed 150 feature movies and 106 short movies. They were selected from 7,361 submissions. Past movies that premiered at SXSW include Furious 7, Neighbors, Chef, 21 Jump Street, The Cabin in the Woods, Bridesmaids and Insidious, and the TV series Girls, Silicon Valley and Penny Dreadful. Although the film festival often shows independently produced movies, studios have often shown their comedies there before they are released. They do this to get an idea of how popular the movie will be in theaters. SXSW Interactive is about new technology. The festival includes a trade show, speakers, parties, and a startup accelerator. According to a festival organizer Louis Black, SXSW Interactive "has probably been the biggest of its kind in the world" since 2007. ↑ "Sxsw Inc". Sxswedu.com. Retrieved March 25, 2014. ↑ "SXSW 2015: The festival changes, but for the better?". latimes.com. Retrieved 2015-11-16. ↑ "About SXSW". Archived from the original on 2011-08-13. Retrieved March 8, 2009. ↑ "Why Most Acts Don't Get Paid At South By Southwest". Forbes. March 18, 2013. Retrieved March 17, 2014. ↑ "History". SXSW.com. Archived from the original on 2015-04-04. Retrieved 2015-04-04. ↑ "SXSW LLC". sxsw.com. Retrieved July 14, 2015. ↑ "SXSW LLC" (PDF). sxsw.com. Retrieved July 14, 2015. ↑ "Past Films at SXSW | South by Southwest 2016 Music, Film and Interactive Festivals - Austin Texas". Sxsw.com. Retrieved 2015-08-13. ↑ Peters, Yves (March 31, 2012). "Man & Gun and Les Bleus de Ramville Win SXSW Film Design Awards". The Font Feed. Retrieved January 11, 2013. ↑ Murphy, Mekado (March 19, 2015). "SXSW 2015: Films That Were the Talk of the Festival". New York Times. Retrieved July 11, 2015. ↑ "Interactive News | SXSW 2013". Sxsw.com. Retrieved April 15, 2013. ↑ "March 8–9: SXSW Accelerator Presented by Oracle Helps Uncover Amazing New Startups | SXSW 2014". Sxsw.com. November 10, 2013. Retrieved March 25, 2014. This page was last changed on 18 June 2018, at 09:43.